Hi Ladies! I am back with the review of The Body Shop Vitamin E Aqua Boost Sorbet which I am using since the last month and a half and am onto my second pot. The Body Shop Vitamin E Aqua Boost Sorbet is a skin moisturizer for summer months. Many of us need to moisturize our skin during summer months. There are many moisturizing creams and lotions available which do this but leave an oily feeling behind which becomes too much to bear for hot and humid Indian summers. Enter The Body Shop Vitamin E Aqua Boost Sorbet which moisturizes skin without that heavy feeling. I am using it this summer season and am totally in love with it. Unlike cream based moisturizer Aqua Boost Sorbet is very light, almost like water. The feel of this product is something like a watery gel. 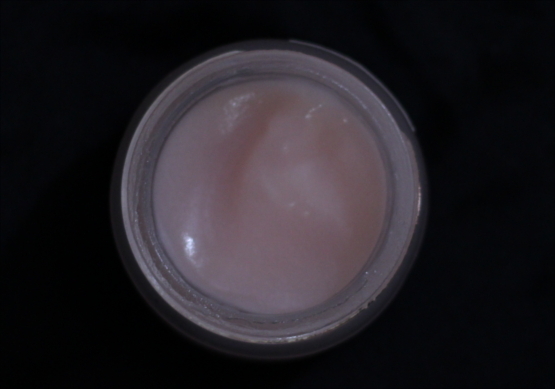 The Body Shop Vitamin E Aqua Boost Sorbet Closeup – If you look closely you can see the micro aqua granules. Each pot contains about 2 million Aqua Spheres. What are aqua spheres? These are tiny moisture spheres which act like reservoirs of water by holding hundreds of time their weight in water. This gives skin a very refreshing and plump feel. You can actually feel these tiny Aqua Spheres by rubbing the product between your thumb and index fingers. Apart from the amazing Aqua Spheres The Body Shop Vitamin E Aqua Boost Sorbet also contains wheatgerm oil, shea butter, soya oil and Vitamin E. It also has mineral particles. These absorb oil and gives a matt finish. Great product for oily skin types. Cleanse your face with a gentle cleanser and pat dry. Dip two fingers into the pot and scoop out the gel. Apply it all over your face with gentle motions. The Body Shop Vitamin E Aqua Boost Sorbet is suitable for all skin types. 1. Very light and ideal for Indian summers. 2. Gives a cool feeling on application. 3. It is a pretty good moisturizer. I am applying once in the morning and once before going to bed. This take’s care of my moisturizing needs. If you have oily skin then you may need to apply it only once. If you have very dry skin apply it three times a day. None that I can think of. The Body Shop skin care products are amongst the best and this one is no different. Some may find The Body Shop Vitamin E Aqua Boost Sorbet a little expensive but hey it is The Body Shop. 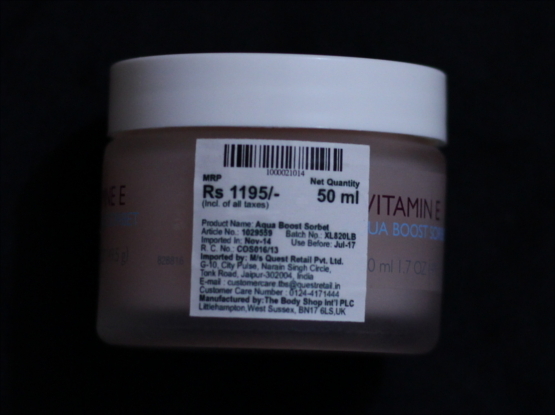 The Body Shop Vitamin E Aqua Boost Sorbet comes in a frosted glass pot. 50ml of this product costs Rs 1195.